Conference attendees will be treated to addresses by President Jean-Claude Juncker, Vice-President Jyrki Katainen, and Commissioners Elżbieta Bieńkowska and Carlos Moedas. Alongside them will be presentations from BusinessEurope, Orgalime (EU engineering industry), Confindustria (Italian business association), Siemens, Airbus, Volvo, and others. On the civil society side, just a handful of trade union and civil society organisations will get speaking slots. 'Competitiveness' looks to be the theme of the day, which is entitled Industry 4.People despite the fact that not one of the sessions deals with labour protection, social justice, or climate change. The Commission is trumpeting #EUIndustryDay as its first ever, but at ALTER-EU we see this event as part of a pattern of excessively intimate liaisons that can lead to corporate capture of Commission decision-making. Our cheeky action will show Jean-Claude Juncker ‘in bed’ with a corporate lobbyist, to highlight that “With the Juncker Commission, every day is #EUIndustryDay”. Corporate interests already dominate the meetings held by commissioners, their cabinet members, and directors-general with outside groups. 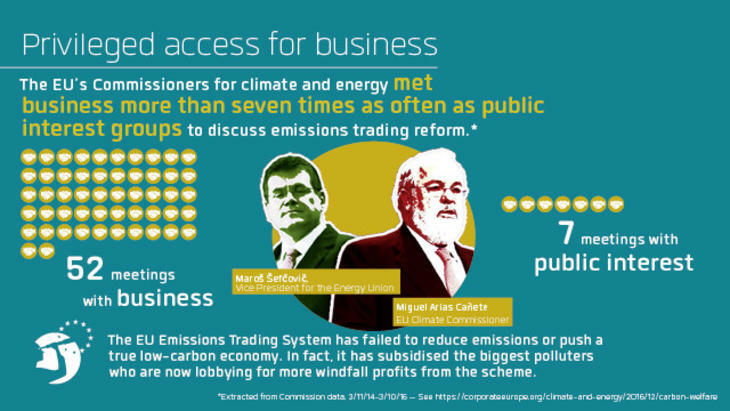 As just one example, new research shows that the energy and climate commissioners (Šefčovič and Cañete) met with business interests seven times more than public interest groups to discuss emissions trading reform, with the biggest corporate winners from the scheme being the ones who got the most lobby meetings. 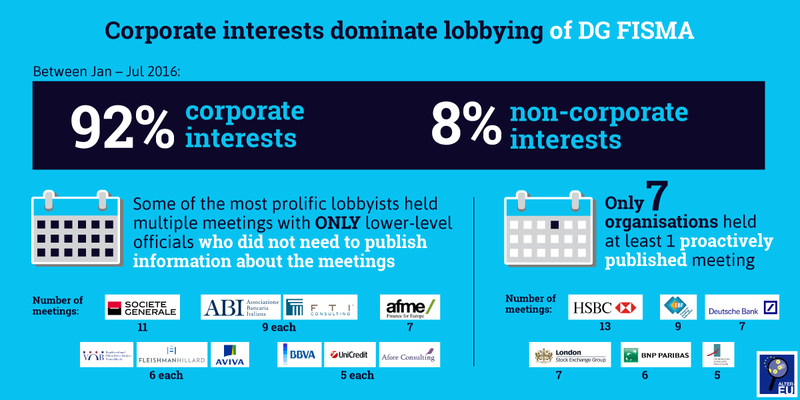 Meanwhile, recent ALTER-EU research shows that when it comes to financial services lobbying, 92 per cent of the meetings held by DG Fisma (the Commission department responsible for EU policy on banking and finance) in the first half of 2016 were with corporate interests, versus only 8 per cent with public interest organisations. Multiple meetings were held with corporate interests such as HSBC, Société Générale, Deutsche Bank, BNP PARIBAS, BBVA, the London Stock Exchange Group, the Italian Banking Association, the French Banking Federation, the European Banking Federation, and the Association for Financial Markets in Europe, among others. 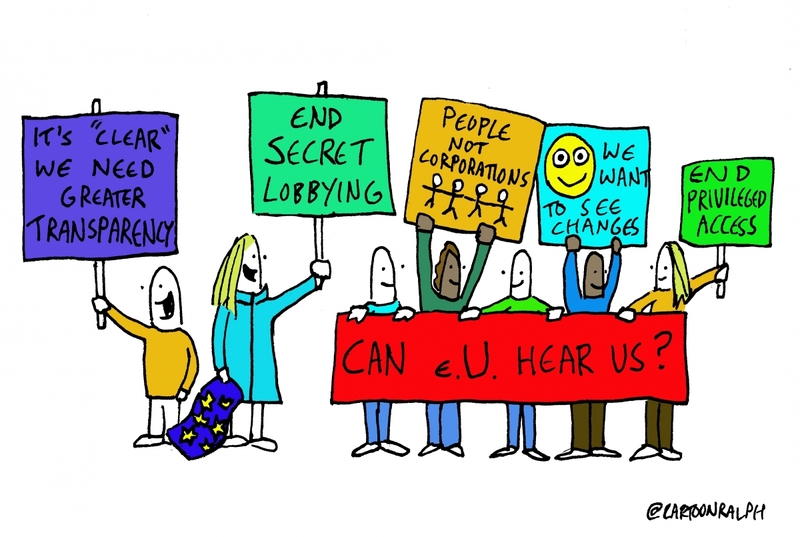 Some corporate interests enjoy extremely privileged access to the Commission, such as BusinessEurope which organises an annual lobby fest inside the Commission. 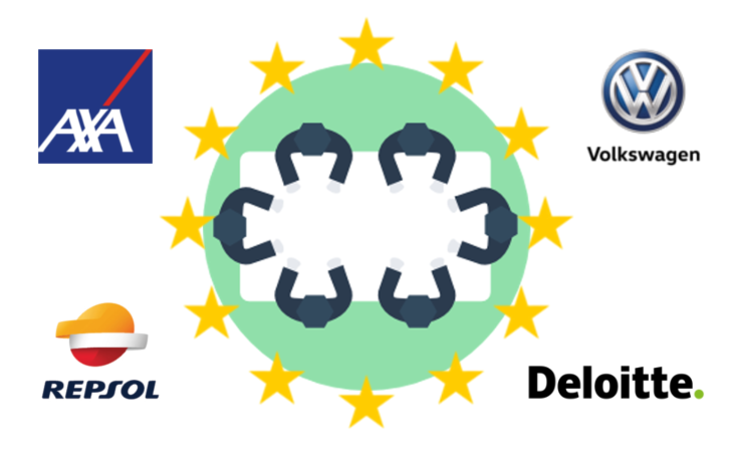 In 2016 the event lasted over 7 hours, and was attended by 4 commissioners and 26 major corporate interests from among BusinessEurope’s membership (who between them spend over €31,789,000 a year on EU lobbying). A recent survey of 10 high-profile Commission advisory groups highlights how industry still dominates these influential bodies, despite new rules which were supposed to ensure balanced representation of interests. Of these 10 groups, 5 remain dominated by corporate interests, while corporations and industry associations also make up 70 per cent of all stakeholders represented across the 10 groups. Only 15 per cent of representatives are providing the Commission with advice on behalf of NGOs, and just 2 per cent do so for trade unions. 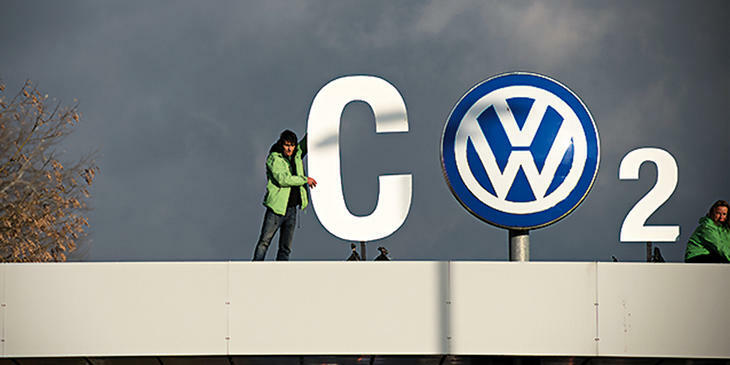 For example, the 'Real Driving Emissions-Light Duty Vehicles', the expert group caught up in the Dieselgate scandal and highly criticised by the Parliament's recent inquiry, has a total of 78 per cent participants from corporate interests. But this is not purely a matter of numbers, and which lobby groups have more or less access to Commission decision-makers. These numbers paint a picture, but what is crucial about the degree of corporate access to the Commission, is the influence or capture of decision-making that results. Take the emissions trading scheme. This is trumpeted as the Commission’s flagship policy to address climate change, but has failed to reduce emissions or make progress towards a low-carbon economy. Instead, it has delivered billions in windfall profits to corporations. Or take the so-called 'Better Regulation' agenda, a policy that is dressed up as tackling needless red tape, but which is actually abolishing and weakening current rules and preventing new ones from being introduced, including in areas such as the environment, workers’ rights, and health. With the help of the 'Better Regulation' agenda, sustained corporate lobbying on the regulation of the use of chemicals in the workplace has delayed new legislation for years. 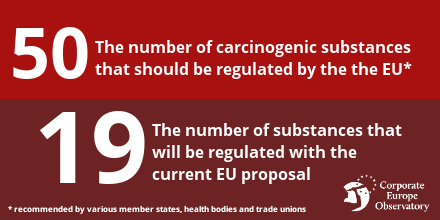 Now the Commission has proposed new legislation, but the number of substances to be regulated is low and the proposed limits to be introduced will still allow tens of thousands of people to die unnecessarily each year. And what about Dieselgate? In 2015, Volkswagen’s diesel cars made in the EU were found to contain cheat devices which provided misleadingly low data on the emission of harmful nitrogen oxides. These are pollutants which in 2015 caused an estimated 75,000 premature deaths in Europe alone. Over time the close relationship between the Commission and the car industry has come to light, and the recent draft report by MEP Gerben-Jan Gerbrandy shows that both the European Commission and EU member states had known since at least 2004-05 that emissions from diesel cars were far above legal limits, without taking action. The Commission did not investigate early evidence of car manufacturers cheating on emission tests and the manufacturers benefited from an industry-friendly emissions testing system that was not fit for purpose. All this and more shows how every day in the Juncker Commission (and indeed the previous Commissions) is an #EUIndustryDay. 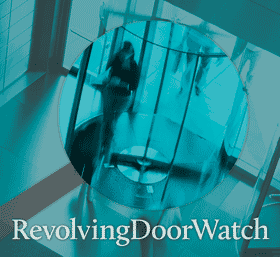 Join us in exposing this corporate capture and privileged access; and demand policy-making that puts the interests of people and planet – not big business – first.